Painting and gardening. These are her passions. "Poppies, peonies, roses, anemones, I love all the flowers in my garden," she says. 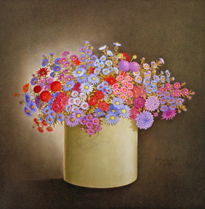 Her floral and still life paintings that capture the light and captivate with their singular luminosity cannot be imitated. 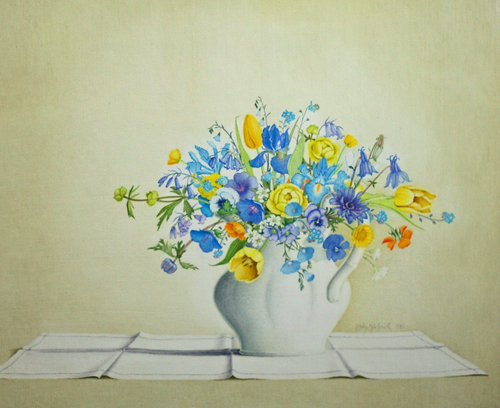 No wonder she was selected by the Bainbridge Island Library to paint the watercolor, Wild flower Bouquet, in memory of Virginia Mudge in 1986 and Nasturtiums, in memory of Ida Thatcher, in 1994. A kindred gardener Virginia Mudge was the Bainbridge branch librarian from 1961 to 1982, dating back to the library's location at Rolling Bay. "She loved springtime and she loved my work," says Rosalyn. Ida Thatcher, early Island first grade teacher, was a faithful volunteer at Bainbridge Arts and Crafts Gallery for many years. 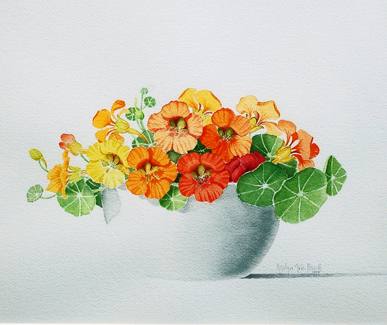 Come summer, every Friday she brought in a round bowl of nasturtiums for the desktop. Growing up in England just a few miles from Stonehenge, Rosalyn Gale Powell remember show she set off at dawn in the fantasy countryside of thatched roofs and medieval bridges to pick the first violets with her mother. She can't remember when she didn't know the names of flowers, shrubs, and birds. In her painting, in her gardening, she claims, "I'm always seeking for perfection and failing to find it." But then she adds with a chuckle, "Gardeners tend to live a long time because they never get it right."